"I am so grateful to Steve and his wonderful caring team. I was in a dark painful place when I found the clinic and they were so supportive and knowledgeable." "The Sussex Back Pain Clinic team really know their stuff, and together they have given me my life back, something which I would not have believed could be done in such a short space of time." If you are in pain and struggling with Sciatica it doesn’t have to be that way. At the Sussex Back Pain Clinic we specialise in the treatment of Sciatica using IDD Therapy, the latest technology from the US. This gentle, safe and effective treatment can achieve dramatic results for those suffering with Sciatic Nerve Pain. If you have Sciatic Pain (nerve pain in leg) which is caused by wear and tear or a disc injury in your low back, IDD Therapy may well be for you. IDD Therapy is a targeted Spinal Decompression treatment. It is precise and safe and uses computer-controlled technology to distract (draw apart) and reduce the strain on specific spinal segments in the lower back where discs are worn, damaged or bulging and putting pressure on the nerve thereby causing Sciatica. Watch our IDD Therapy patient video to see how IDD Therapy Treatment for Sciatica works and what our patients say. Many of our patients’ stories have been featured in the national press and you can read these at the bottom of the page. How Does IDD Therapy Help Sciatic Nerve Pain? By decompressing (taking pressure off) the specific disc that is trapping the Sciatic nerve and causing the Sciatica and stretching the soft tissues, the mobility of the spine improves, allowing the body’s natural healing mechanisms to operate more efficiently, relieving pain caused by muscle spasm and alleviating trapped nerves and irritation. For a simple explanation of how spinal decompression works watch this video. Who can IDD Therapy help? Most patients we see for IDD Therapy typically have chronic Sciatica (nerve pain which travels down the Sciatic Nerve, through the buttocks and legs and sometimes into the foot causing pins and needles or numbness). By “chronic” we mean they have been experiencing pain for more than three months. Some of our patients have already been diagnosed with a disc problem, others are not aware of what is causing their Sciatica. The cause of your Sciatica will be determined in our detailed assessment. When Sciatic pain is not resolving and manual therapies are not working, IDD Therapy helps to bridge the treatment gap. Rather than live in pain, or consider pain management, spinal injections or in extreme cases surgery, IDD Therapy offers another treatment option with which we can achieve dramatic and life-changing results. 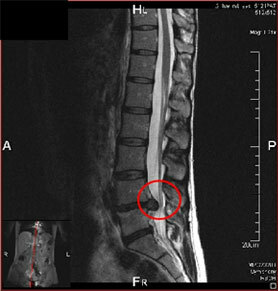 The MRI scans below show the spine of Julia, one of our patients. 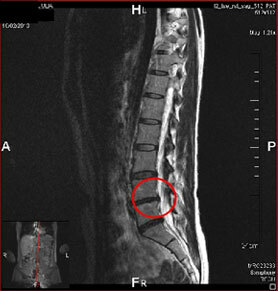 At 36 years old she was crippled with Sciatic Leg Pain and underwent a course of IDD Therapy to decompress a large disc bulge at L4/5, circled in red, as seen on the left side ‘before’ scans. The ‘after’ scans, taken 6 months later, shows the bulge has all but disappeared. These results followed a six week course of IDD Therapy Sciatica Treatment combined with rehabilitative exercise, after which, her severe Sciatic Leg Pain had completely resolved. She has now been able to return to an active, pain-free life and is very happy again. As with any medical procedure results will vary from person to person and cannot be guaranteed*. When it comes to your health you want to be assured that you are in safe hands. Established in 1990, and under the care of clinic director and lead osteopath Steve Morris, the Sussex Back Pain Clinic has been leading the way in spinal care for over 25 years. At the Sussex Back Pain Clinic we have been pioneering this treatment since 2010 and have helped hundreds of patients suffering from Sciatica avoid surgery, reduce or remove their reliance on painkillers and regain control of their lives. As the third clinic in the UK to provide IDD Therapy Treatment we are experts in this field and the most experienced IDD providers in the South of England by several years. We are part of a growing network of over 1000 clinics worldwide providing the therapy. All IDD Therapy clinics use internationally-recognised research tools to monitor patient progress and outcomes. With IDD Therapy, you will undergo a course of treatment. For some patients, symptomatic relief can come suddenly but, for most, with longer standing conditions, change occurs more progressively. Your supervising clinician will discuss your treatment plan with you. Pain relief and improved quality of life are the key aspects of treatment. The principal objective of IDD Therapy is to decompress the disc which is causing the Sciatic Nerve entrapment and restore mobility. By progressively improving mobility in the spinal segment over the course of treatment, the body’s natural healing mechanisms can operate more efficiently and the goal of long term pain relief rather than a short term fix can be achieved. Injections – patients who are considering or are having spinal injections can undergo IDD Therapy. Most spinal injections are intended to relieve pain and create a pain-free window for other treatments. Injections on their own do not address underlying compression and immobility of spinal segments and should be given in combination with structured rehabilitation to address the causes of a condition. To find out if IDD Therapy can help with your Sciatica, just call our dedicated IDD Therapy line on 01273 201866 where one of our receptionists can arrange an IDD Therapy Assessment appointment for you. We schedule a whole hour with you so that we can spend enough time to really get a good idea of what is happening, to make sure that IDD Therapy is the best option for you and that you fully understand the treatment process. During your assessment a full case history is taken, you will receive a thorough examination and, if you have any MRI scans or other investigations, these will be addressed as well. Once we have established the cause of your Sciatica, we will discuss the treatment and what the outcomes are likely to be for you so that you can make an informed choice as to whether this treatment is for you. If we require any further investigation this can also be arranged for you at this stage. Following your assessment, if you decide that you wish to proceed with this treatment you can usually commence your course of IDD Therapy within a week of your assessment. If caught early, Sciatica can be resolved simply with manual therapies such as Osteopathy or by a course of corrective exercise and we will refer you within the clinic to the appropriate practitioner if this is the case for you. As a dedicated Back Pain Clinic we have many avenues open to us to help you with your pain and get you back to health. Leighton Batchelor, a 38 year old kitchen fitter, suffered debilitating disc and sciatic pain for nearly 6 years due to a herniated disc. Leighton had a six week course of IDD Therapy and, two years on, he remains out of pain. Neil Cranston, the 44 year old MD of an events company, suffered for 4 years with a prolapsed disc causing excruciating pain in his lower back and hips. Joanna Barrett, a 46 year old interior designer/property developer, suffered from a herniated disc and sciatica for 18 months. Two years on Joanna has no pain.